Elfdoll will re-open registration for one week from January 1-7. 2010. It is unclear at this time whether they will be taking on-site registration or email requests. Click the word ‘register’. A link opens up a pop-up window form. According to the header on the company website, Elfdoll will offer a special present for customers who purchase over $300 between October 1-31, 2009. 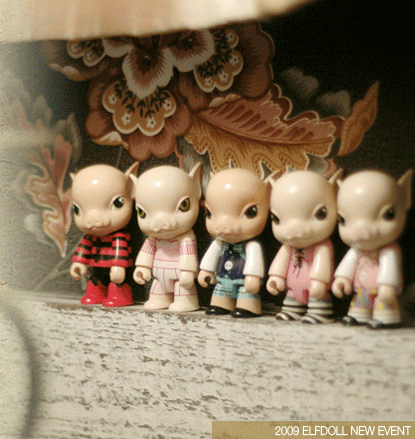 They will include a set of 5 Alice Qee pig figures with the order. According to the notice, the prices of some of their items will be lower, and they are instituting a point system for purchases. There will also be a VIP customer system. Any customer who purchases over $1000 will become a VIP customer at the end of that month. VIP members will see a special VIP menu when they log into the website. There will be various special events and discounts offered to VIP members. Elfdoll has been renewing the website over the last few weeks and is about to release the new re-vamped Rainy doll line. 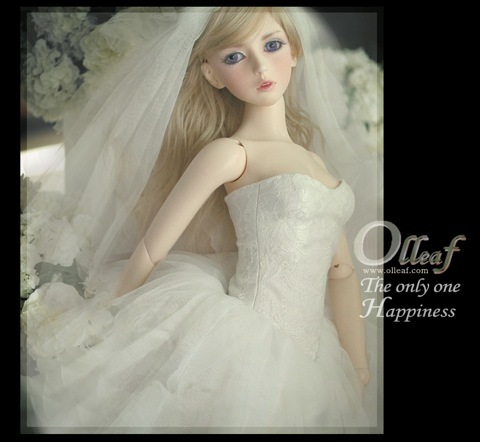 The Olleaf special ‘The Bright Day’ One-of-a-kind doll is now available for order. The doll is a 58 cm. tall ElfdollLydia in normal skin with a wedding dress with accessories, wig, eyes, face-up and Elfdoll body parts. 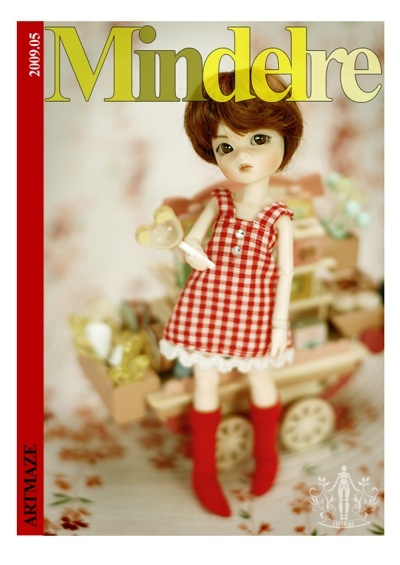 The Doll Peddler is taking pre-orders for a limited number of ‘Gimono’ outfits for MSD (41 cm. ), Elfdoll Hana (20 cm. ), and tiny dolls (14 cm.) from Elfdoll. The outfits will be limited to no more than 10 of each sold. Information for ordering is on the home page of the Doll Peddler website. A new Elf Doll, 41 cm. Twiggy Yumi, will only be available to Elfdoll’s exclusive dealers in the US and Canada. She is limited to 40 dolls. Twiggy Yumi comes with a default head, a half open eyed head, face-up, dress regular and fist hands, and brown eyes. The doll is only being made in normal skin color resin. The second wave of 14 cm. Elf Doll tinys with revamped bodies has now been released. The newest tiny dolls made available are elf Olivia, and the three sisters Jin Dal Re, Bong Sun Hwa, and Min Del Re. All of the dolls are fullsets with outfit, wig, and face-up. The sisters comes with both fist and flat hands and flat feet. Olivia comes with the same hand and foot sets plus an extra set of elf boot feet. All the dolls come in normal color resin. Update from The IDEX 2009 Show in Orlando, Florida. Dale Rae of Dale Rae Designs has sent information and images from the show. Note: The report is an overview or trends at the show. 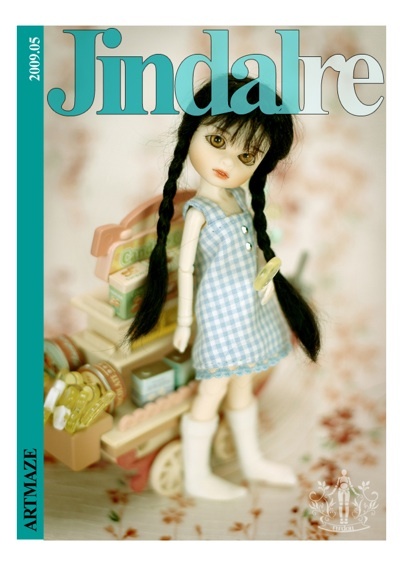 Information includes not just BJDs but related dolls by other companies.